I learned a little something about myself last weekend. When immersed in a city I adore, surrounded by bustling people, towering buildings, a cacophony of sounds and a myriad of smells both good and bad...I am not a very good photographer. Or, perhaps better stated, when distracted by new experiences I tend to forget that I am a photographer. Don’t be mistaken, Brian and I lugged camera equipment all over the West Village, Meat Packing District, Brooklyn Heights and DUMBO, gave ourselves sore necks and shoulders and stressed ourselves out on the subway thinking about the amount of money strapped to our bodies in the form of photo gear, but returned with an embarrassingly low amount of shots. I seem to have a hard time peeling my eyes from the sky, the street, the architecture and the bakery windows to step behind the camera and look through the lens. And its not just New York City, the same can be said of Boston and New Orleans, both cities that Brian and I love but for which we have very little documentation of our visits. I’m trying to decide if this is such a bad thing, since a lack of photographs is typically the result of the two of us having a very good time. Whether it be good company, good food or good surroundings, if we’re in the middle of a good experience, I lack the ability to stop and capture the moment. Clearly, I need to learn how to multi-task. The sparse amount of quality pictures in this post is quite the opposite of what I envisioned as we packed up our gear, debating which lenses to take and worrying about memory card space. Upon our return and my download of images, I seriously contemplated just forgetting about a Bella Eats: NYC segment, but it saddened me to not, in some way, acknowledge the amazing time we had, as short and busy as it was. Bella Eats, while providing a space from which to share recipes, photographs and stories with you all, my readers, has also become a bit of a journal for me - a place to document my adventures in the kitchen, to witness my growth as a photographer, to work on my voice as a writer and to record revelations I have about various aspects of my life. Such as the fact that my camera needs to become a part of my daily routine, and that I should be documenting more than just food. And so, in an attempt to challenge myself as a photographer and to give myself yet another creative outlet (can you ever have too many?!?) I’ve started a little photo journal over at tumblr. My plan is to post at least one photo each day, with whatever camera is available to me, along with whatever it is that I am thinking as I take the shot. My hope is to raise my awareness of the moments that make up my life, both big and small, and to document as many of them as I can without taking away from the moment itself. Because I am never without my iPhone, most photos will be taken with it and perhaps doctored with an app like ShakeItPhoto, or BestCamera. This exercise is about developing my eye, not my skills, and so I prefer the low-tech (can you call the iPhone low-tech?) non-pressure of snapping a photo and immediately uploading it, rather than fussing with camera settings and editing software like Adobe Lightroom and Photoshop. 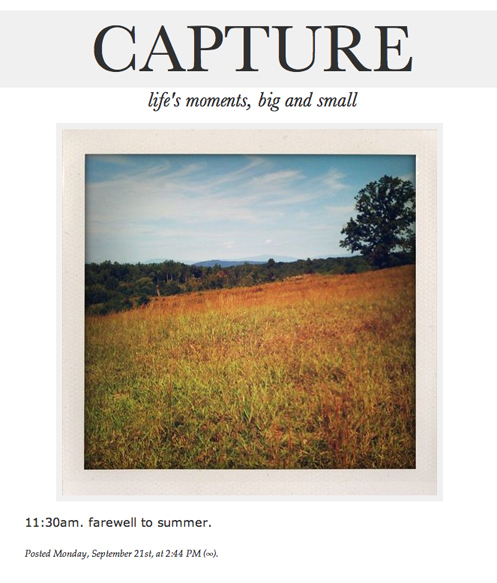 The journal is called capture, and you can check it out here if you’d like. It is not about food, although since food encompasses a large part of my life there will surely be some appearances by dishes and drinks that have an impact on me, both good and bad. It is a personal project, so the moments captured will likely only mean something to me and perhaps the person that I share them with, but may not appeal to a larger audience. However, because I was inspired by the lovely Becka of Studio222Photography to start this journal, I thought that it was only appropriate that I share mine with all of you, and hope that some of you may be inspired to start your own. View from our hotel room, straight down into Ground Zero. 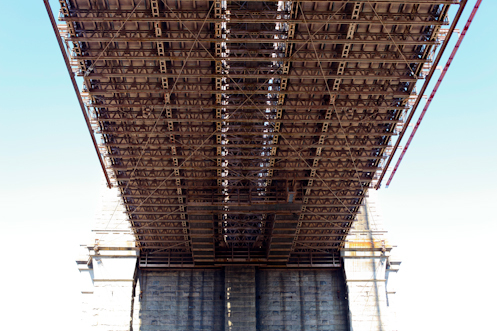 Sobering to see, but fascinating to watch the construction from 33 stories above. This was a fantastic place to stay if you're planning on concentrating your time in lower Manhattan and Brooklyn, as we were. A visit to Chelsea Market in the Meat Packing District, so that we could try and spot some Food Network stars (filmed upstairs) and get a sticky bun from Amy's Bread. We drooled over olive oils, dried pastas and cured meats at Buon Italia, and wished we lived in the Village so that we could take home some milk, yogurt or cheese from Ronnybrook Milk Bar. The wedding Saturday was at the Brooklyn Historic Society, a lovely setting that fit the bride (one of my most creative girlfriends from high school) and groom perfectly. After the beautiful ceremony, we all ate, drank and danced the night away. I was lucky enough to reconnect with two other girlfriends from high school, which means that, surrounded by good company, we have very few photos to share of the evening. The desserts were catered by Baked in Brooklyn, a bakery I've been following from a distance for a few years. Sadly, we didn't make it there to visit, but the wedding desserts were absolutely amazing and I highly recommend a visit to the bakery to try them for yourself. A bakery in Brooklyn that we did visit was Almondine. Oh my. Rated by NY Magazine as New York City's Best Bakery, the tiny shop on Water Street did not disappoint. We were there when it opened, standing on the front steps with a handful of locals waiting anxiously for the doors to be unlocked. Our first round through the line (yes, we went through twice) yielded the best croissant of my life (almond) and a raisin croissant for Brian. With round two, Brian brought a chocolate croissant (pictured below) and a slice of mushroom, broccoli tomato quiche to the table. The croissants were as light as air and the quiche was creamy and rich. My only recommendation? Buy extras, and fly them home with you. I promise you'll be wanting seconds the next day. And don't miss Jacques Torres across the street. ...and the Flea Markets that happen underneath them. Again, I was surrounded by shiny (and not-so-shiny) objects, so other than this shot, and the fabulous necklace I bought from artist Jessica DeCarlo, I have no evidence of the Brooklyn Flea. 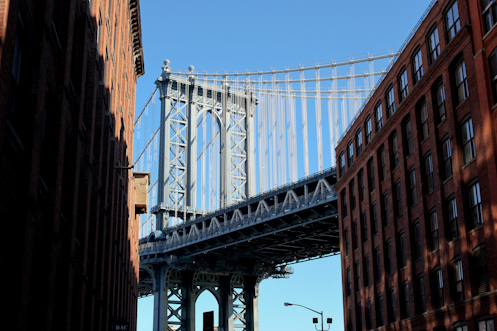 But if you're ever in DUMBO on a Sunday morning, take my advice and wander over to the underside of the Brooklyn Bridge. You won't be disappointed. Thank you all for your NYC recommendations! I only wish we'd had more time to spend, and look forward to our next trip. That's the beauty of having a blog, I'll have your recommendations and this post to reference for our next visit! I'll be back in a couple of days with a meal perfect for the summer-to-fall transition. In the meantime, you can follow me on twitter or capture.